Pinot Meunier is relatively rare in Australia, compared to Pinot Noir, and often overlooked as a result. Closer examination of the wines we are making from this variety show us just what is possible. Pinot Meunier, like the ugly duckling, stands out as different to all the "other" Pinot during winemaking. When allowed to grow and develop, it turns into a swan of unique beauty. Floral notes and a sense of sunshine and generosity characterise this unusual variety. During vintage, there are parcels of fruit which arrive in the winery which are undeniably superior, showing strong character, interesting complexity and compelling personality. Of course, we readily use such parcels in our Vintage wines, but sometimes it’s possible to tirage a smaller parcel as a standalone, unique cuvée. 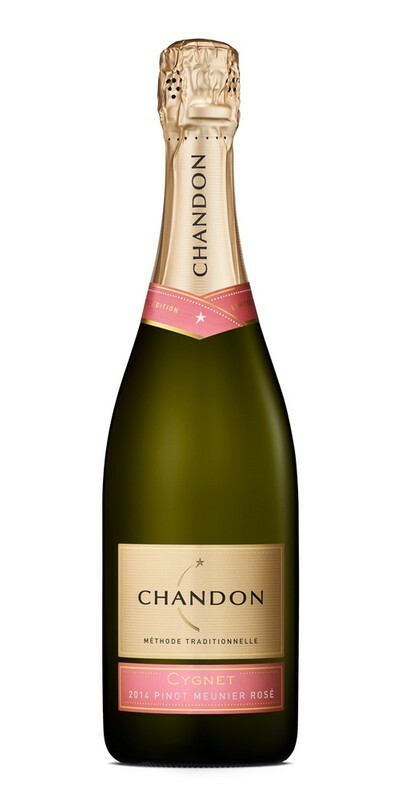 Chandon Cygnet Pinot Meunier Rosé 2014 is a special opportunity to present this single variety from our estate vineyards. The wine is a delightful rose petal pink colour with persistent mousse. Strawberry, redcurrant and pink grapefruit aromas, typical of Whitlands fruit, provide a ‘fresh scones straight from the oven’ effect. The palate echoes of red currant and pink grapefruit and ginger biscuit, alongside creaminess, fine bubbles and bright acidity. Whitlands Plateau, at over 780 metres elevation, gives us the majority of this blend. Pinot Meunier at Whitlands is remarkably floral, with rose petal and honeysuckle notes overlaying pink berry aromas. A small portion from Strathbogie and Coldstream complete the blend, adding palate weight and further complexity. Grapes were harvested at optimal ripeness, when sugar, acidity, flavour and maturity all came together. By machine harvesting and direct pressing, pure and fine cuvée juice can be quickly run-off with minimal oxidation. Cold fermentation follows, leading to wines with bright fruit characters and delightful acidity. Base wine parcels are then carefully blended to achieve balance and complexity in this delightful rosé wine. Secondary fermentation then takes place in bottle, as per the méthode traditionnelle, and extended ageing on yeast lees prior to disgorgement. A small amount of red wine was used as a colour base to inform the colour of the blend. This wine has been aged for 36 months prior to disgorging. A season full of promise with good soil moisture and excellent bud burst soon turned challenging with the untimely arrival of cold, wet and windy conditions in September during flowering. This resulted in fewer bunches setting and a reduced crop for many growers. Good weather favoured the remaining crop from October to December. January arrived with warm summer conditions and a few hot days to challenge the grapes but overall good soil moisture and a strong, vibrant canopy permitted steady ripening under fantastic conditions. What had been a challenging season for quantity turned to great optimism for exceptional quality. Cool nights and bright sunny days allowed for the development of flavour and maturity. Beautiful fruit with intensity, freshness and abundant natural acidity was the result.